Hines and Russell Crowe had just released the Remedy single (clip at end of interview) and her Amazing album tour was about to roll into Warragul. I expected to be given only around 10 minutes for a phone interview, but in the end we talked for maybe half an hour. On stage and screen Hines has always seemed a compassionate, friendly, and real person; that is certainly not an act. The interview touched on performing, op shopping, the legacy of her time as an Australian Idol judge, and Russell Crowe. You can read it in full below. I have decided to keep the more dated questions in as Hines’ responses are an interesting insight into her performance style. The image above was taken from the Remedy video clip. William Kulich: What can people expect from this tour? 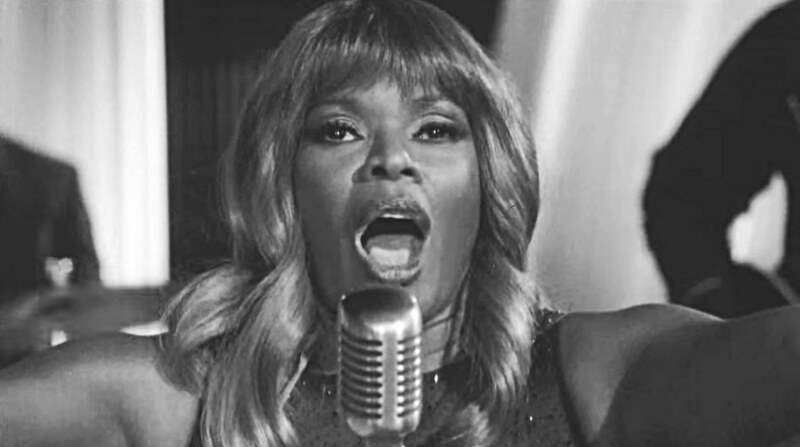 Marcia Hines: Hopefully, first and foremost, fun and some great music. I’ve got six really great guys that I work with and we put the show together. We practised and rehearsed for a month. One of the most important things about the show is we’ve put in a lot of the old songs, because I think that’s very important to do. So we’ve sprinkled the show with a lot of the old songs and some new songs and some other things in between, and a lot of fun and dancing. Will: How much time do you usually put into planning tours? Marcia: It all depends. I’m a bit of a stickler for getting it right, so I could’ve done it for two months but that would’ve been too much. In the end when we were rehearsing we all agreed it was time to stop rehea-rsing and take it out on the road. Will: How does this tour compare to others you’ve done? Marcia: It’s different because it’s a brand new band for me, so that’s different, and also I’ve made sure the guys are very integral to the show. Two of the guys who wrote the album with me, the keyboard player who is our musical director is on tour with us as well, and one of the other writers, and one guy called Chris who came up through Australian Idol, and he’s one of my singers as well. Will: Are there many other people you’re still in contact with from Idol? Marcia: Yes, some. We were so deeply entrenched in their lives, it was pretty full on. You make friendships and I’ve been able to maintain several. Will: You’ve played across the world in many venues. What’s the appeal of playing in Warragul? I was looking at your tour list and it’s the furthest east in the state you’re coming. Marcia: It’s important we go to rural areas as well. I think a large part of my success in the beginning was because we’d go to areas nobody else would go to and I’m a great believer that those areas deserve to see you, if not more than than the city centres because they don’t get as much. They’re not spoilt and they appreciate what sort of show you bring to their towns. Will: What was the best crowd you have ever played to? Marcia: There have been several but I have to say there was one really great show one year when my mum was still alive, and I closed the big parade at the Sydney Mardi Gras, the dance party of Mardi Gras, I closed it. There were many thousands of people when I walked on and I couldn’t sing because they cheered so much. I got home after the performance… and my mum said ‘how was it?’ I said ‘I think I could die now, I know what it is to be loved.’ The audience just lifted the roof with their applause. Will: What kinds of crowds do you enjoy playing to? Marcia: Every crowd is different, and that is really fascinating to me. I like different audiences because they bring something so different to the table. I love seeing people’s reactions, I love standing on stage and seeing people mouth the lyrics to my song and I think ‘wow.’ That’s very moving for me, I don’t know what it is but it’s very moving for me. Will: You’ve done many, many tours in your career. Do you still approach touring in the same was as you did when you started? Marcia: Uh-huh. I don’t drink, I don’t smoke, I’m a vegetarian and I exercise as much as possible when I can. My instrument is my body so I cannot plug it in, so at the end of each night I go back to my accommodation and I go to bed. I have never been a person who stays up late at night or who rages or something like that. Will: Do you get much time to poke around the places that you visit? Marcia: No! If I do get time to poke around the place I have to get in at around 11 o’clock in the morning or something. I like op shops, so if there’s an op shop I might go check out an op shop, or if there’s a jewellery shop, when I say jewellery I mean, you know, just stuff. I’m just an ordinary girl. Will: I’ll give you a heads up: Warragul has five really good op shops. Marcia: Okay, I’m there. See, you’re feeling me. I love op shops, they’re brilliant. Will: So, ‘Amazing’ the song, album and tour. Is that how you feel these days? Marcia: I’m feeling good, and maybe amazing every once in a while, you know. It was just a great song to write about love, when things are beautiful and you’re really happy – it is an amazing time. No matter what happens, when you’re in love it’s just all wonderful. Will: You’ve now done a duet with Russell Crowe, the question was going to come up, I’m sorry,…. Marcia: Oh no please, by all means. I’m very proud of it. Will: It’s a great song, but is he really as unreliable a caller as the song suggests? Marcia: (laughs) I couldn’t really answer that because I’ve not had a love affair with Russell Crowe. Russell and I are buddies, and this song, when I wrote it I said to him ‘look I’ve got this song, I would love you to sing it with me, it’s truly tongue-in-cheek.’ When you listen to women all they ever say is ‘he doesn’t call me enough, I wish he’d call.’ Russell directed the film clip, so it was just great fun. It was pretty astounding to work with someone with such an incredible work ethic – I’ve not met someone who works like that in my life. Will: It sounds a really fun thing to do. What do you have planned in the near future in other recordings and so on that you’re working on? Marcia: I’m not working on anything at the moment because I think you can only do one thing well at a time, and right now Amazing is out. We’ve written about four or five songs, but we’ll start to formulate something maybe early in the [next] year. Will: What’s the most recent album you bought? Will: What do you like about him? Marcia: He’s a pure singer. The guy’s a great talent. His album is definitely on repeat. Will: What do you enjoy in the music industry most? Is it the touring or recording? Marcia: My favourite thing in the world is live performance because there’s nowhere to hide. It’s a very honest way to go about performing.